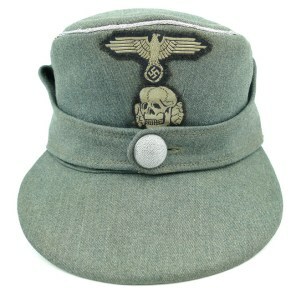 WH (Heer) DD Transitional Droopbill Helmet (Stahlhelm). This is a commercially made M18 style double decal droopbill helmet, complete with size '59' liner and incomplete chinstrap. 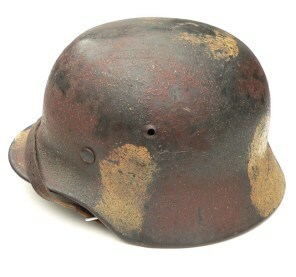 Nice original early helmet in very good condition! 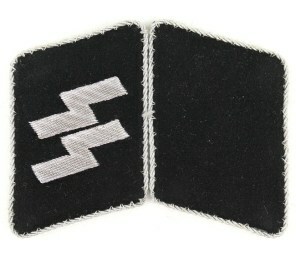 Waffen-SS BeVo-woven 'Nederland' cufftitle (Ärmelband). 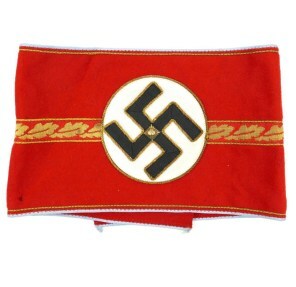 The cufftitle is in full length condition with typical unfinished ends and measures approximately 41cms in length. The cufftitle is in good unissued condition showing some staining and traces of years of storage. Nice original cufftitle! 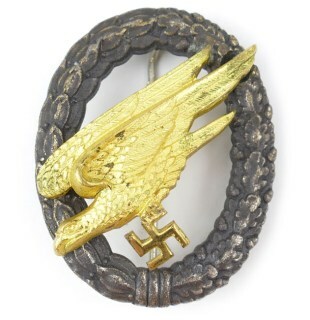 Luftwaffe Paratrooper Badge (Fallschirmschützenabzeichen). 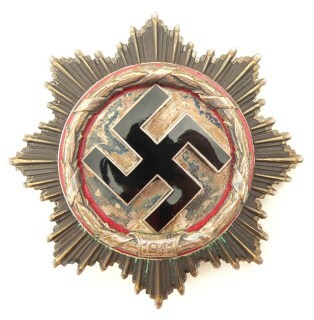 The 'Buntmetall' badge is not visible maker marked but can be attributed to the company of 'Friedrich Linden' from Lüdenscheid. 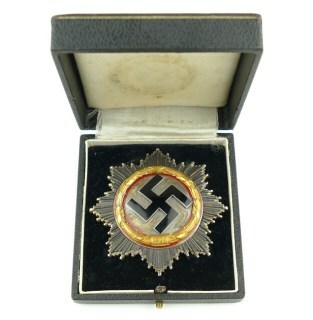 Extremely rare badge in very good condition! 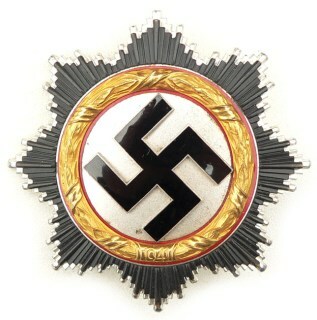 'Infanterie Sturmabzeichen in Silber' (Infantry Assault Badge). The hollow tombak type badge is not visible maker marked, it can be attributed to the company of 'Wilhelm Deumer' from Lüdenscheid. 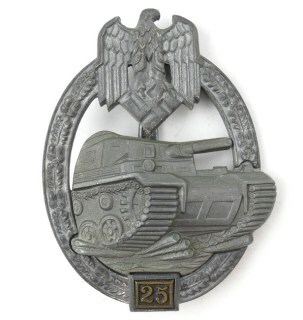 Nice original early war badge in good condition! 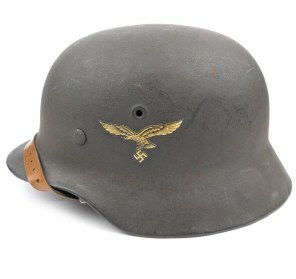 Luftwaffe M40 Single Decal Combat Helmet (Stahlhelm M40). 'EF64' marked shell, complete it's original size '57' liner and original late-war RB.Nr. marked chinstrap. Nice untouched original helmet in very good, near mint, condition! 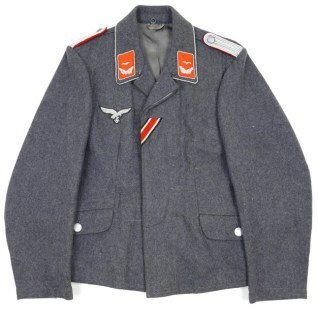 Luftwaffe FLAK Officer's Flight Blouse (Fliegerbluse). Complete with breast-eagle, collar-tabs and shoulder-straps. The flight blouse is nicely 'L.B.A.' 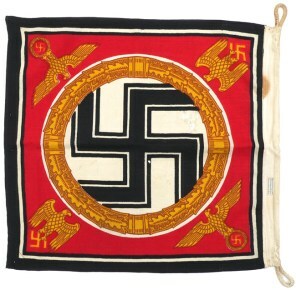 marked and dated 1943. Nice original Flight Blouse in very good condition! 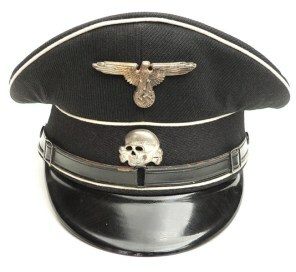 Ultra rare Belgian made Waffen-SS skull. 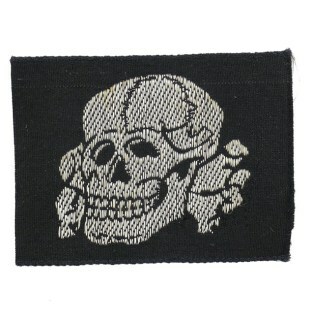 The skull is executed in a weave pattern similar to the BeVo-weave, in white-silver thread on a black linnen background. Rare original Belgian made example in good unissued condition! 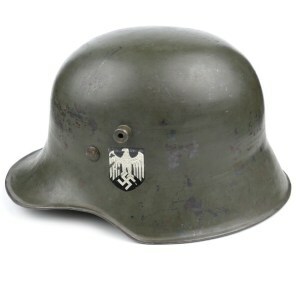 WH (Heer) M18 Single Decal Combat Helmet (Stahlhelm M18). 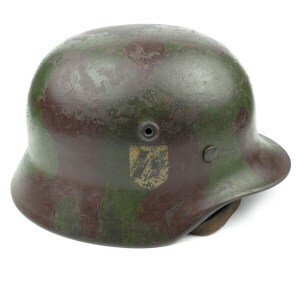 'ET66' marked helmet complete with liner and (damaged) chinstrap. 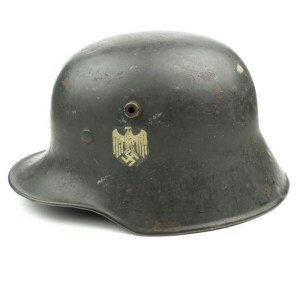 Nice original helmet in good used condition! 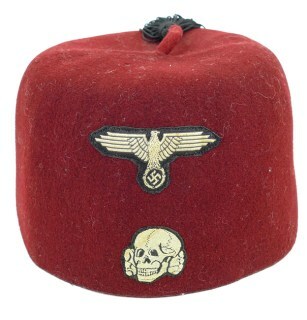 Waffen-SS maroon-coloured felt dress 'Fez' as intended for members within the '13.Waffen-Gebirgs-Division der SS "Handschar" (kroatische Nr.1)'. Complete with its original black tassel. The fez is having a BeVo woven cap-eagle and skull attached. Nice original fez in very good condition! 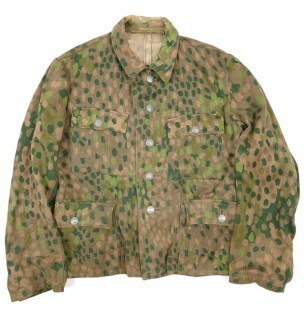 Wehrmacht (Heer) M42 Field Blouse (Feldbluse M42). 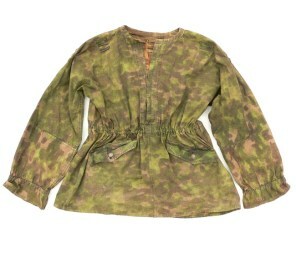 Nice mid war field blouse, complete with original machine-sewn breast-eagle and collar-tabs. 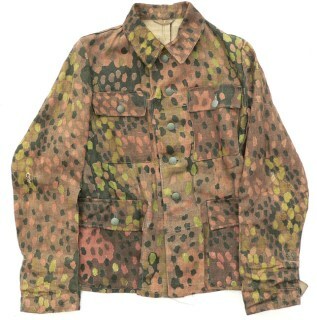 The field blouse is maker marked by 'Steinmeyer' and dated 'F42'. 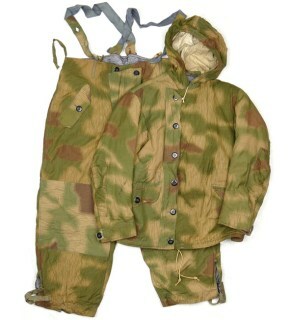 Hard to find original untouched EM's M42 tunic in good condition! 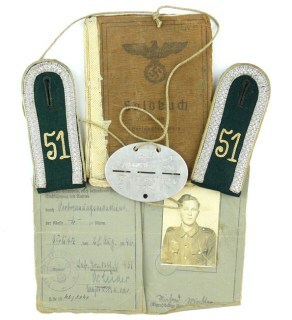 This is a very nice matching grouping of a Wehrmacht soldier within the 'Infanterie-Ersatz-Bataillon (mot) 51', consisting of his Soldbuch, Driver's License, a 'M36' type pair of shoulder-straps and his matching ID-disc (Erkennungsmarke). Great original set! 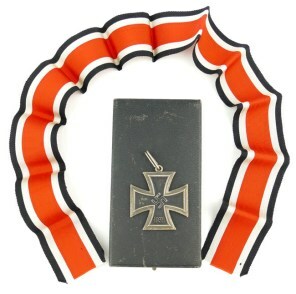 WH (Heer) 'Kurland' Cufftitle (Ärmelband). The cufftitle is in full-length and measures approximately 22cms in length. The cufftitle is in very good unissued condition. 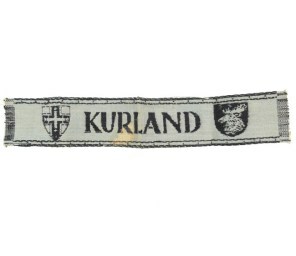 Rare original 'Kurland' cufftitle in very good condition! 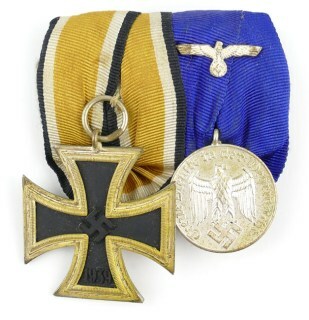 Nice 2-piece medal-bar consisting of a non-maker marked 'Juncker' Iron Cross 2nd Class and a WH (Heer) 4-years long service medal ('Wehrmacht-Dienstauszeichnung 4.Klasse für 4 Jahre Dienstzeit'). 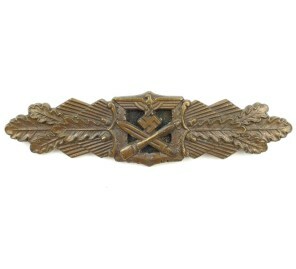 Great original Medal-Bar in good condition! 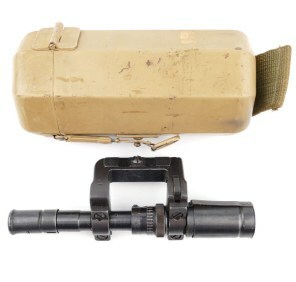 Wehrmacht ZF41 Sniper Scope with Mount (Gewehr-Zielfernrohr 41/1), complete with original tan painted metal carrying case. The scope is nicely marked with 'fvs' indicating production by the company of 'Spindler & Hoyer' from Gottingen. Great original sharpshooters scope in case! 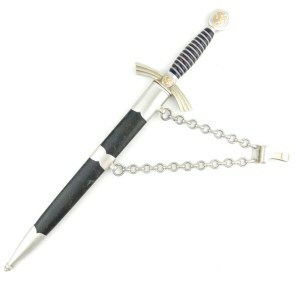 First Pattern Luftwaffe Officer's Dagger (Luftwaffe Offiziersdolch). 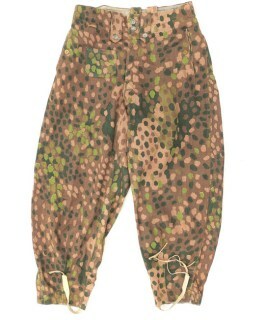 This 1st pattern was called 'Borddolch' or 'Fliegerdolch'. Nicely maker marked by the company of 'Eickhorn' in Solingen. Nice early aluminum example in very good condition! 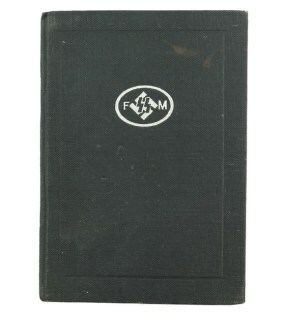 SS-FM 'Förderndes Mitglied' Supporting Membership Booklet (FM-Mitgliedsbuch). The booklet is named to 'Richard Mayer' from Stuttgart, he was having membership number 'E 53297'. Rare original SS-FM Membership Booklet in very good condition! 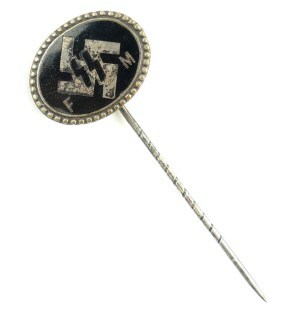 SS-FM 'Förderndes Mitglied' Supporting Membership Pin (FM-Abzeichen). 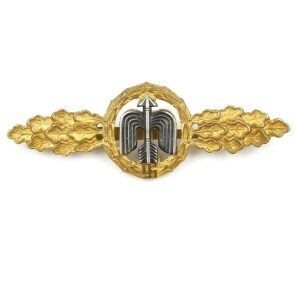 The reverse of the pin is marked with 'Ges.Gesch.' and manufacturer 'Deschler MCHN-9' and its individually numbered with membership number 'E 24749'. Rare original SS-FM Membership Pin in good used condition! 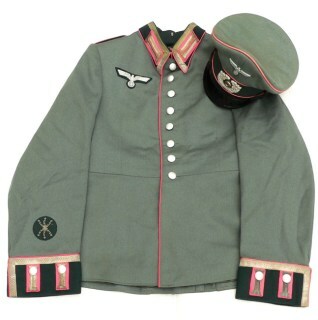 Wehrmacht (Heer) M43 Field Blouse (Feldbluse M43). Nice late war field blouse, complete with original machine-sewn breast-eagle, collar-tabs and a pair of Infantry shoulder-straps. 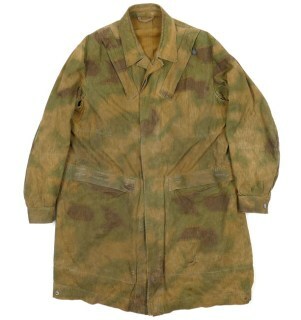 The field blouse is nicely marked and dated 1943. 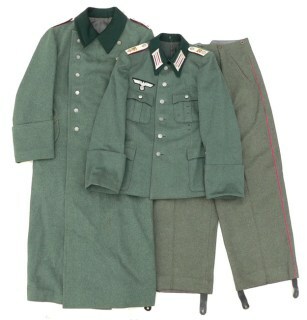 Hard to find original late war M43 tunic in very good condition! 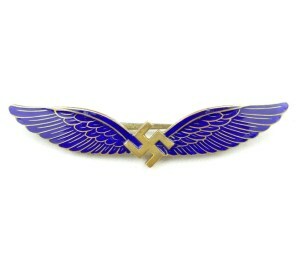 Civil Pilot's badge (Zivil-Flugzeugführerabzeichen). The early tombac badge is not visible maker marked but can be attributed to the company of 'C.E. 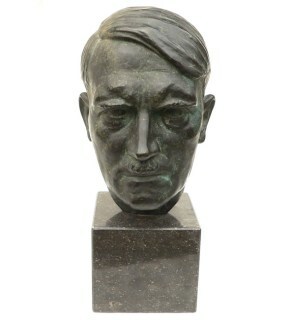 Juncker' in Berlin SW. The badge shows very nice & pronounced detail overall. 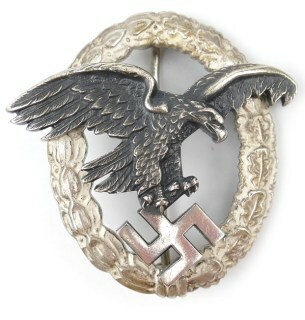 Desirable and rare original civil pilot's badge! 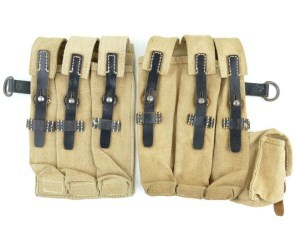 This is a nice pair of Wehrmacht MP38/40 Magazine Pouches (MP38 u. MP40 Magazintaschen). The tan coloured pouches are nicely maker marked and dated with 'clg43'. Hard to find original pair of MP38/40 magazine pouches in good condition! 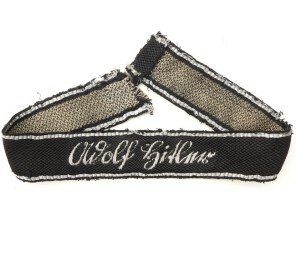 Pair of hand-embroidered bullion Waffen-SS Officer's Collar Tabs (Kragenspiegel für Führer). 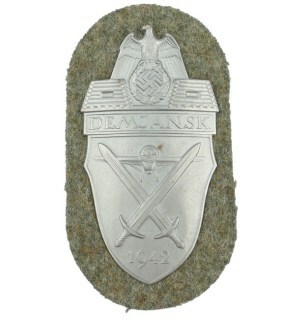 The rune collar tab is having its original RZM etiket ('C-Stück') attached. The collar tabs are still tied together. Rare original set in stunning mint and unissued condition!